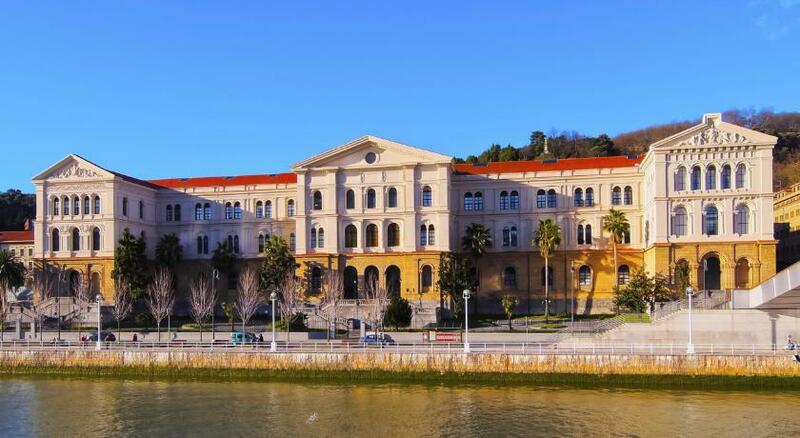 Lock in a great price for NH Bilbao Deusto – rated 8.3 by recent guests! When we check out on Monday 22nd at 12:00, the man who checked us out was great. Vestibule room had lots of space for luggage storage and provided an extra sound barrier from the hallway. Very large room. Very helpful staff and centrally located. Good location close to the Guggenheim. Clean, nice rooms. The man at the front desk was super friendly and very helpful. Very helpful and friendly staff. Helped out with the map and all the questions about the city. The hotel is very near the Guggenheim museum ... by foot. It is also near the old city ... by tram or bus with nearby stops. The service was good as was the breakfast. Helpful staff at the check-in/info desk. Clean hotel. The reception guy was awesome, very good spirit and gave us a lot of many good recommendations to visit Bilbao!! NH Bilbao Deusto This rating is a reflection of how the property compares to the industry standard when it comes to price, facilities and services available. It's based on a self-evaluation by the property. Use this rating to help choose your stay! 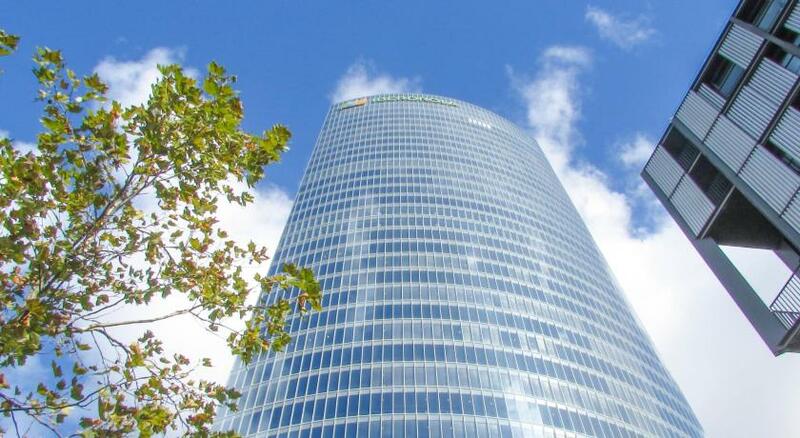 NH Bilbao Deusto is just just over a quarter mile from Bilbao’s Guggenheim Museum, Iberdrola Tower and Euskalduna Palace. There is a free Wi-Fi and the modern, air-conditioned rooms have satellite TV. All rooms at the Hotel Deusto have a pillow menu and a minibar. The private bathroom comes with a hairdryer and luxury bathroom products. The hotel’s Txipiron restaurant opens upon previous request or for groups. It offers a varied buffet breakfast and a lunchtime menu of fresh, local food. In Bilbao's business district, NH Deusto Hotel is a short walk from the historic center of the city. There are bus stops just 50 feet from the hotel and Deusto Metro Station is a quarter mile away. You can also find a tram stop 350 feet away. The highway exit is just one minute's drive from the hotel and Bilbao Airport is less than 4 miles away. When would you like to stay at NH Bilbao Deusto? This modern, air-conditioned room includes flat-screen satellite TV, a pillow menu and a minibar. The private bathroom comes with a hairdryer and toiletries. Please note guests requiring a double bed are requested to note this in the Special Requests Box during booking or by contacting the property using the contact details found in the Booking Confirmation. Private parking is available on site (reservation is not needed) and costs EUR 17.60 per day. 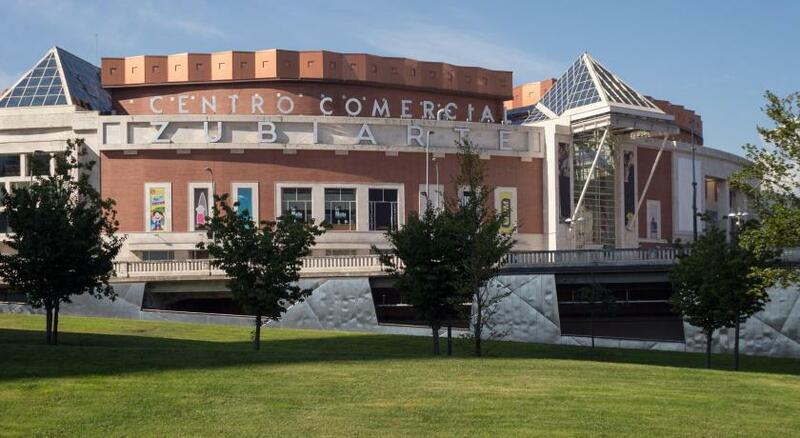 The hotel is in the heart of Bilbao: the Guggenheim Museum is 10 minutes on foot and it’s a 15-minute stroll to the Euskalduna Congress Hall. You can also head out and explore Bilbao’s restaurants, which are within easy walking distance. House Rules NH Bilbao Deusto takes special requests – add in the next step! NH Bilbao Deusto accepts these cards and reserves the right to temporarily hold an amount prior to arrival. Please note guests requiring a double bed are kindly requested to note this in the Comments Box during booking or by contacting the property using the contact details found on the Booking Confirmation. Tiny bedroom for a pretty extortionate price - we paid nearly 250 euros for 2 nights and the room was tiny. The cold AC didn’t work. We asked to borrow an iron on Saturday afternoon and were told that he wasn’t sure if they let guests use irons (first time in my life a hotel has queried the guest use of an iron). I suspect there were bedbugs as I woke up covered in insect bites. Parking is expensive also so we parked around the corner on the street for free. Didn’t bother trying breakfast as it was also expensive. Absolutely everything, ideal place to stay in the city. Great location (everything in 10-15 min walking distance), nice service and helpful staff (they made me checked in even at 7am upon my super early arrival), comfortable bed, nice room, good cleaning, good breakfast, convenient underground parking. Didn’t like the hotel, dirty, the people was rude. I wouldn't come back. breakfast was good a lot of pastries available. location of the hotel, just near a shopping centre and the railway. friendly staff and very helpful. The doors of the rooms and the bathrooms have to be repaired immediately. Breakfast was good. No hot meals though. Guggenheim is in a walking distance yet you have to walk around 30 minutes to reach to the old town. Better location I can't imagine. The staff was extremely helpful and friendly and gave us the amazing tips about what to do, where to eat, how to spend time etc. The comfort of the room was better than expected and definitely better than what we saw in the pictures. Location is not bad, only 10-15mins walking distance from the center and also from the bus station if you want to visit the cities close by. Good variety of pastries and bread in breakfast but cold scrambled eggs. They could improve that part for a perfect experience. Large bedroom and comfortable beds. The room was not perfectly clean when we arrived, but it was not too bad to complain. The temperature in the wardrobe was pretty high, I guess because of the mini-bar working all the time. It was not a big deal, I was just a little bit worried if there was a problem with mini-bar overheating. The bathtub floor was slippery and the shower door was awkward to use. The location is just great. Welcoming and helpful staff. Comfy bed. Laminate on the floor instead of carpet, which is good, because some other hotels have problems with cleaning carpets:) Wi-fi was ok.
Not sure pet friendly applies. Aside from the high fee there was a page of rules with our favorite being adult supervision required at all times. Who did they mean us or our dog? Hotel is in an excellent location. A five minute walk to the Guggenheim Museum and 15 minutes along the beautiful river walk to the Old City. At an extra 22 euros a day for our dog I'd call the hotel marginally pet friendly. Room 212 was larger than expected and very comfortable. Full bathroom including tub was an unexpectedly pleasant surprise. Good breakfast. Parking is located under the hotel and a bit tight but doable. GPS took us right to the hotel.